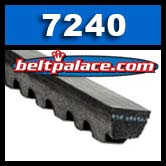 and PTO Belts > Gates Lawn Belts - Special Belts - CLEARANCE PRICES > Gates 7240 Auto XL Belt. Gates 7240 Auto XL V-Belt. Gates 7240 Auto XL Belt. OBSOLETE. PLEASE CALL FOR CURRENT REPLACEMENT SIZE. Gates 7240 Auto XL Belt. Replacement BELT 10A0610 for Lawn Equipment and Gates Special Belt 7240. Replacement belt. 3/8" top Width x 24-5/8" L. Gates V-belt. Also used in ATVs, Golf Carts, Snowmobiles, and Power Scooters. 3LX250 Cogged FHP V-Belt, Industrial Grade. 3LX250 Cogged FHP V-Belt. Industrial Grade. 3/8" W x 25” Overall Length. Cogged Heavy Duty 3L250 FHP construction.